In preparation for hunting season, we went looking for the best hunting boots. Below you’ll find our top picks and reviews, but we want to hear about your favorite boots. After countless hours of research and testing we selected the LaCrosse Alphaburly Pro as the best hunting boots for men. This is an 18″ tall rubber boot with a neoprene liner that is comfortable enough to wear year-round. 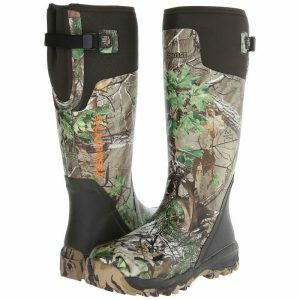 We chose a rubber boot because they are the most comfortable and durable style of hunting boots. In contrast to boots that are designed for hiking, these boots will keep your feet dry and blister free even after a long day in the woods. It’s not uncommon to find us wearing these boots while working around the farm, fishing or even when we go offroading. If you’re like us, these boots will get use all year long, not just during hunting season. A special feature about this boot is that it has a rubber gusset on the back that makes it easy to remove the boot after a long day. Plus, it is easy to adjust the size of the boot opening to fit your calf – whether large or small. The non-insulated version of this boot is great for temperatures as low as zero degrees Fahrenheit. However, LaCrosse also makes several insulated versions of this boot that will help you stay warm at temperatures 70 degrees below zero.